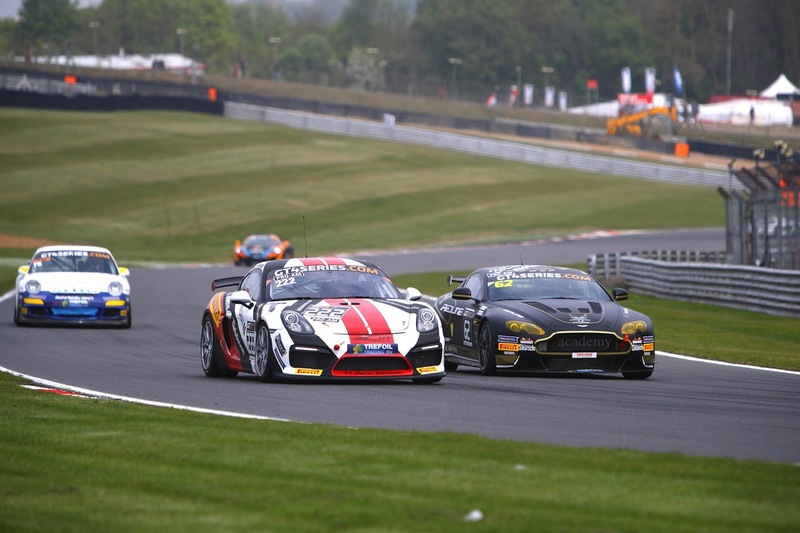 A fast, furious and eventful opening race of the European GT4 Series Northern Cup's Brands Hatch meeting had all on the edge of there seats this morning as 30 odd GT4 cars started their first one hour race of the day. A poor start from Will Moore in the #62 Academy Motorsport car saw him get passed by numerous cars even before they got to the first corner with his stablemate #61 Quantamatic Car of Dave Robinson alongside from P13. After some gutsy racing Moore had soon recovered some of the situation and was battling for fifth but a wide line coming into Sheene Curve would see his car spin out into the gravel forcing a Safety Car just before the mandatory pit stops. 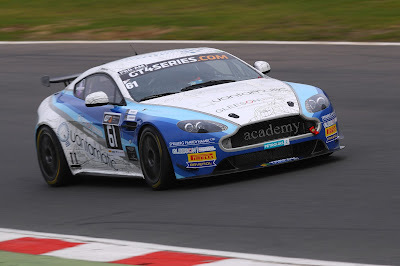 Worse was to come for Academy when Mike Hart, now in the #61 Quantamatic car should an equally over quick approach into Sheene Curve, narrowly avoiding all the armco and cars around him before becoming beached in the gravel at Stirlings - another Safety Car. The repeated demands of a Safety Car (another was to follow before the end) at least kept bunching the field back up together leading to some more, eventful racing. Matt George continued some good early work in the Generation AMR SuperRacing #144 to finish P9 whilst the remaining Aston Martin V8 Vantage GT4 of Street Art Racing's Jerome Demay and Denis Dupont finished P14.